Finding yourself in a precarious situation? ''S all good man'! We have just the right criminal... lawyer for you. This classic character provided more than just legal loopholes and comic relief. Known for his nonchalance and questionable advice, Saul quickly won over fans worldwide. 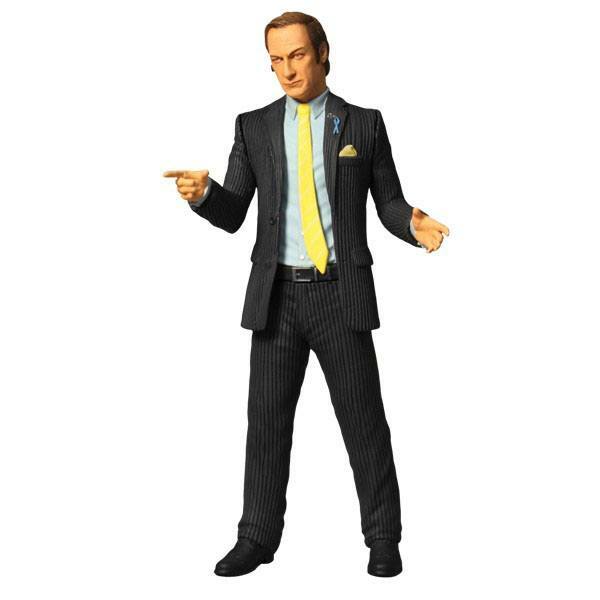 Walter and Jesse narrowly made it through their troubles with his legal counsel and now this 6-inch figure can stand as a reminder when you're in a bind, Better call Saul! His pinstriped business suit is complimented by his token wireless headset and light blue Wayfarer 515 awareness ribbon. Saul Goodman comes complete with his business card in a display friendly blister card package. Although his work with our dynamic duo is done, we know we haven't seen the last of him just yet.